Echinacea has a rich tradition of use by North American Plains Indians who used it medicinally more than any other plant. It was prominent in modern American medicine in the early 20th Century, and was discovered by Europeans, who have used it extensively since the 1930s. Today millions of Europeans use echinacea as their primary therapy for colds, flus, infections, and for general immune-boosting effects. Echinacea increases the "non-specific" activity of the immune system. In other words, unlike a vaccine which is active only against a specific disease, echinacea stimulates the overall activity of the cells responsible for fighting all kinds of infection. Unlike antibiotics, which are directly lethal to bacteria, echinacea makes our own immune cells more efficient in attacking bacteria, viruses and abnormal cells, including cancer cells. Echinacea facilitates wound healing, lessens symptoms of and speeds recovery from viruses. Anti-inflammatory effects make it useful externally against inflammatory skin conditions including psoriasis and eczema. It may also increase resistance to candida, bronchitis, herpes, and other infectious conditions. Clinical Study: an extract of echinacea showed an increase of 50%-120% in immune function over a 5 day period (Jurcic, et al. 1989). Clinical Study: an extract of echinacea significantly increased the resistance to flu and reduced the symptoms of lymph gland swelling, inflamed nasal passages and headache (Braunig, et al. 1992). Clinical Study: Of 4500 patients with inflammatory skin conditions, including psoriasis, 85% were cured with topical applications of echinacea salve (Wacker & Hilbig, 1978). 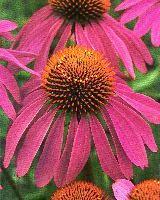 Echinacea has an excellent safety record and is very well tolerated by most people. There is no known toxicity. Echinacea should not be used in progressive systemic and auto-immune disorders such as tuberculosis, leicosis, connective tissue disorders, collagenosis and related diseases such as lupus, according to the German Kommission E. Its use in AIDS or opportunistic infections in AIDS patients is controversial. Liquid extracts (or tinctures): very popular forms for ease of use. May be alcohol- or glycerine-based. Extract strength varies, so following manufacturers' directions is important. Recommended amounts range from one to five droppersful per use (0.5-5 ml.) three times per day. Capsules or tablets: may contain root powder or herb. Recommended usage level: 1/2 - 2 g per use three times a day. Usage recommendations are from the British Herbal Pharmacopoeia and official sources from Germany (Kommission E and Standardzulassung). With long-term use, echinacea appears to lose effectiveness. Maximum periods of continuous use: 6 - 8 weeks. Echinacea is not a substitute for other medical interventions in rapidly accelerating infections. If the condition persists or worsens, seek medical advice. Many serious medical conditions are not appropriate for self-diagnosis or self-medication and require the supervision of qualified health care providers. Use caution when practicing self-care. Echinacea, Nature's Immune Enhancer by Stephen Foster. Healing Arts Press, 1991. Echinacea, the Immune Herb by Christopher Hobbs. Botanica Press, 1990. Botanical Influences on Illness by Melvyn Werbach and Michael Murray. Third Line Press, 1994. See chapters on Cancer, Candidiasis, Immunodepression, Infection, Wound Healing. Herbal Medicine by Rudolf Weiss. AB Arcanum, 1988. Kommission E Monographs: Echinacea. Kooperation Phytopharmaka, , Germany. Jurcic, et al. Zeitschrift fur Phytotherapie 10 (2), 1989. Braunig, et al. Zeitschrift fur Phytotherapie 13: 7-13, 1992. Wagner and Proksch 1985 In: Economic and Medicinal Plant Research, Academic Press, Orlando, p.113. Wacker & Hilbig. Planta Medica 33(1): 89-102, 1978. Luettig, et al. J. Natl. Cancer Inst. 81(9): 669-75, 1989. Steinmuller, et al. Int. J. Immunopharmac., Vol. 15, No. 5, pp. 605-614, 1993. This page and all contents © 2001 by The Herb Research Foundation, Boulder, CO, USA.